Summary: Robert John Langdon, based in South Downs in East Sussex, is set to change the course of history with his new book Dawn of the Lost Civilisation. The book looks at the story of Human Anthropology and reveals through exclusive evidence that the builders of the world famous megalithic monument were built by a lost civilisation of mariners. Robert John Langdon’s second book of his epic trilogy ‘Prehistoric Britain’ will be published mid-Summer Solstice day of June 21st, 2016. 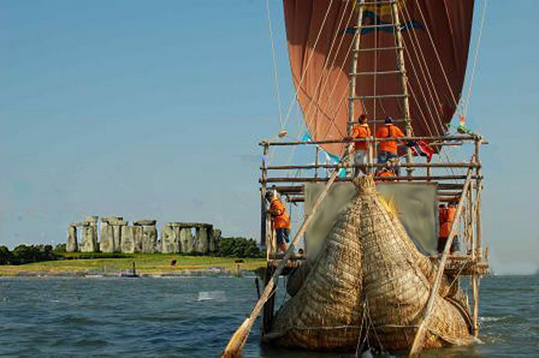 It contains exclusive evidence that the builders of Stonehenge were a lost civilisation of mariners that sailed to the four corners of the known world ten thousand years before Columbus and Ferdinand Magella. Aptly titled Dawn of the Lost Civilisation, Langdon has followed the ancestral line of these ‘Cro Magnons’ from the cradle of humanity in Africa to a spot where Homo Sapiens first meet and crossbred with their Neanderthal cousins to create a ‘new humanity’ from which we in the Northern Europe are direct descendants. Using ancient Greek written accounts of oral history, the new science of DNA and archaeological evidence, Langdon has built up a picture of not only who built Stonehenge, but moreover, what they looked like and even what language they spoke. This remarkable evidence that is set to change history shows that these mariners that Victorian archaeologists named Cro-Magnon (a separate species to Homo Sapiens) due to their gigantic statue and size lived and traded in a period of history known as the ‘Golden Age.' Even latter-day myths and tales still talk about this society that people also call ‘Utopia’ and was known as ‘Atlantis’ to the ancient Greeks. In his first book of the trilogy, Langdon discovered that this civilisation known to archaeologists as the 'megalithic builders' existed and built their stone monuments, thousands of years earlier than the existing experts currently believe. This scientific evidence is found in sites like Stonehenge, Avebury, and Old Sarum, where carbon dating has now shown that they were constructed about five thousand years earlier than previously understood. The Author Robert John Langdon explained: "It was a time the great ancient writings of Plato who told of a great ‘advanced ‘ maritime civilisation that also existed, that was subsequently lost to the world when their island was flooded in a great storm and their citizens scattered throughout the world." Langdon has now identified this lost continent as Doggerland in the North Sea, which archaeological findings have found sank at the same time as Plato’s writings. Moreover, the size and location of this Lost World match his detailed description. This synergy allows Langdon to conclude that all the archaeological, anthropological and historical written evidence indicates that once a great nation of humans of gigantic proportions he calls ‘Homo Superior,' due to their higher intelligence and ability to adapt the natural world and live successfully by inventing new technology. This technology includes boats, which people take for granted today. The book also goes on to show that the remnants of this civilisation live on in what today’s anthropologists call ‘modern man’ and is responsible for the technologically advanced age we currently enjoy rather than playing with stone tools as our ancestor did for two million years without this ‘quantum’ evolutionary leap.